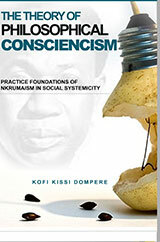 In the Theory of Philosophical Consciencism, Professor Dompere establishes how Nkrumah used the theory of categorial conversion housing the necessary conditions of transformation to design strategies for creating the sufficient conditions for socio-political transformations. The theory of Philosophical Consciencism is about the institutionally destruction-creation process for socio-political transformation. The theory shows the scientific contributions of Nkrumah’s thinking to the solution of the transformation problem in science and its application to social systemicity, where Nkrumah’s analytical weapons were drawn from African conceptual system. The theory is developed as logico-mathematical foundations that guide the internal management of the command-control decision-choice systems for creative destruction of socio-political varieties in transformations through the development of qualitative mathematics making possible the construct of qualitative equations of motion for connecting varieties in qualitative transfers. The qualitative equations of motion through the Philosophical Consciencism constitute the sufficient conditions for transformations. The theory links rationality, intentionality, experiential information structure, defective-deceptive information structures in the control-dynamic games of power and dominance by the duals and poles under the principle of opposites with relational continua and unity relative to decision-choice systems that induce negation-negation transformations, where paths are established by the history of success-failure outcomes in the socially control-dynamic zero-sum games between the duals in any duality and between the poles of any actual-potential polarity. The main premise of the monograph is that there exists a set of sufficient conditions in support of the necessary conditions for internal transformation of socio-natural varieties. The theory is useful in understanding developmental processes and multi-polar-power zero-sum games for global dominance. The necessary conditions constitute the natural necessity that constrains cognitive freedom. The sufficient conditions constitute cognitive freedom that must overcome the necessity in socio-natural systems dynamics. Had this conceptual system been familiar to African leaders, the African transformation from colonialism to complete emancipation, rather than neocolonialism, would have been increasingly successful. This holds for those seeking triumph over injustices, oppression, imperialism and social change in all systems. Kofi Kissi Dompere is a professor of economics at Howard University. He has authored a number of scientific and scholarly works on economics, philosophy, and decision theory and related fields. He has also authored a number of monographs including twelve monographs with Springer Science Publishers, three with Greenwood Publishers, and two with Adonis-Abbey Publishers. His teaching areas include Economic Theory, Mathematical Economics, International Economics and Cost-Benefit Analysis as decision theory. His current research foci are on Theory of Development Process, Qualitative mathematics of transformations, epistemics and mathematics of fuzzy phenomena and their application in economic decision, mathematics of transformations and General information theory. He is the producer and host of a radio program “African Rhythms and Extensions” on WPFW 89.3 FM, in Washington D.C., USA. a member of Pacifica Foundation.